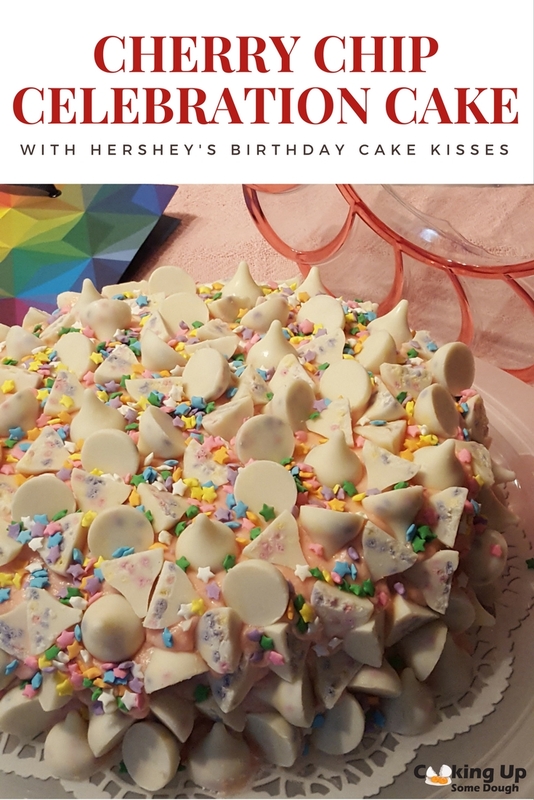 Since last week, when I used my Facebook group to report the introduction of the new Hershey’s Birthday Cake Kisses, I’ve been waiting to make this cake. The Kisses weren’t due to arrive in Walmart until today, September 12th, but there was a rumor that the candy had been spotted on store shelves a little early. Unfortunately, no stores in my area carried them. When I heard about the Kisses, I immediately wanted to create a special dessert. I considered trying a thumbprint style cookie but no one flavor of cookie stood out to me as a flavor profile to pair with the white chocolate Kiss. I recalled a conversation that I’d recently had with my cousin about the little known practice of bakeries using a boxed cake mix and adding a few ingredients to the batter for a richer taste. This would be a perfect opportunity to test one of those cakes. For some reason, the color pink came to mind. I thought about using sprinkles in the cake to mirror the sprinkles that were supposed to be in the Kisses. But then, I remembered the look of a cake that was probably out in the 70s. It was a Cherry Chip Cake. I thought it would complement the new Kisses perfectly. Keep in mind that as I’m planning this cake, I still haven’t actually seen or tasted the new Kisses. I went on the hunt for the Cherry Chip Cake mix and discovered that it was very difficult to find. As I stood in the store searching for a solution, I decided to try a white cake mix and add maraschino cherries to it. I came home and searched for tips to make a box mix taste like homemade. 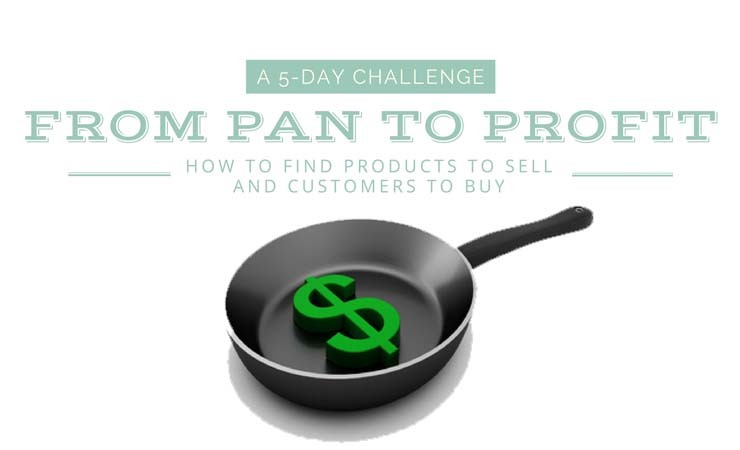 Some of the tips called for so many additional ingredients that I might as well have started the recipe from scratch. There were a number of tips however that called for eggs, butter and milk. So, I made the cake a day in advance and I’m writing this as I wait for the stores to stock their shelves. I wanted a pink frosting with the color and flavor coming from the maraschino cherry juice. Searching through Pinterest, I found a great recipe for Maraschino Cherry Frosting at Mom On Time Out. Because I am sensitive to almonds I substituted an Imitation Clear Vanilla extract so as not to muddy the color. Update: The Kisses are here! I cut some of the kisses in half from the top to show the confetti look inside. I then randomly scattered them around the cake, pressing them into the frosting. Next I added sprinkles for an even more festive look. 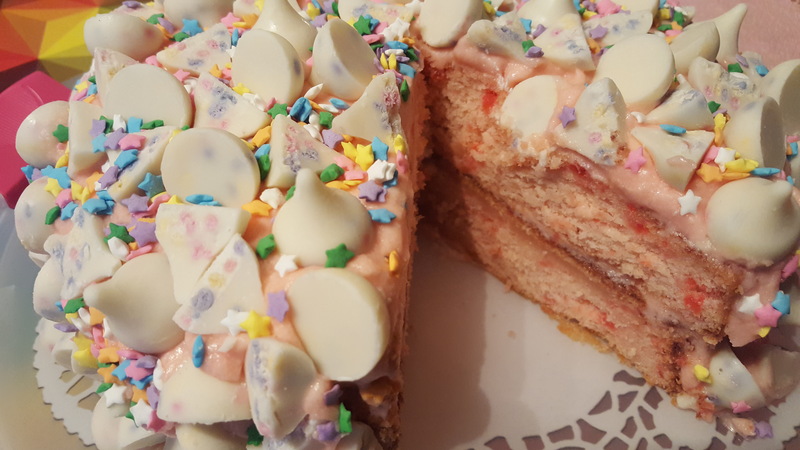 Here’s an up close look at the inside of the kisses and the maraschino cherry chips inside the cake. This cake is delicious but it is very sweet. 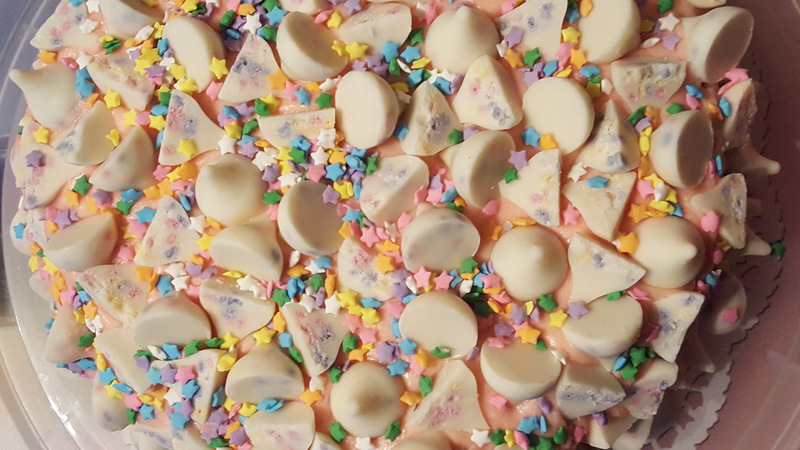 With the richness from the eggs, butter and milk, giving the taste of homemade, and the overload of candy, you can only have a small slice. The cake definitely lives up to its’ name – Celebration Cake. Mix cake according to package directions, making the addition of the egg and replacing oil and water with melted butter and milk. Add the vanilla and cherry syrup and mix. Stir in the maraschino cherries by hand. Bake cake according to package directions. While the cake is baking, make your buttercream frosting. Refrigerate. Unwrap the candy kisses. Cut about 40 in half. Set both aside until ready to decorate. After the cake has completely cooled, lay strips of parchment or wax paper around the edges of the cake stand. Add a dollop of icing in the center of the plate and lay the first layer of the cake on top. 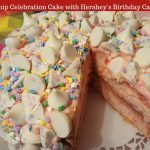 The icing anchors the cake and prevents it from sliding as you decorate and the paper strips keep the plate edges clean. Give both layers a crumb coat and refrigerate about 30 minutes until buttercream is firm. Ice cake again generously with the buttercream. Gently press sprinkles into the side of the cake. Press kisses randomly into the sides of the cake, adding a few of those that have been cut so that inside is facing outward. After decorating the sides, add kisses to the top of the cake. Add sprinkles to the top to cover the spaces between the kisses. Once your icing and decorations are complete, gently pull the paper strips from under the edges of the cake.